I love--and I mean love with all my heart--your skis, especially my side-cut 80 Voodoos that travel with me on every ski trip for powder, crud, ice and groomers. But I'm no longer a fan of your gear bags, namely one in particular, the Super Haul 2-Pair Wheelie Ski/Board Bag. I want to love this bag as affectionately as I love my skis--in fact, I planned to do so when I purchased it. It looked sturdy, it offered plenty of space for all our gear, it featured more bells and whistles than its predecessor, it received good reviews from other purchasers, it was a bargain buy at Sierra Trading Post. But I can't love it because it's broken, busted and beat up. It only took one round trip flight for the damage to start on a zipper track that's better designed for a coat than a piece of luggage. That tiny issue--like a bag was thrown on top and landed just right to cause damage--led to a jammed zipper that finally gave way after said bag sat peacefully in our storage closet for eight months. Within minutes a zipper fell off the track while the second zipper worked but only to a point. We thought it looked fine for travel, after all it had barely been used by most travel standards, and our old ski bag that was completely trashed when we replaced it with this one, but apparently the airline and/or the TSA didn't think so. Our Rossignol bag arrived in Utah sealed shut with what looked like an entire roll of packing tape (and giant thank you to whomever was given the task of fastening our broken bag back together so it could make it to its destination with our gear in one piece), no zipper to even attempt to zip the bag back up, and the busted zipper dangling by the single track it was still attached to, completely useless. If only I had pictures of the sad state of our bag arriving at the Salt Lake airport. Do you follow me? The bag is broken and all of my attempts to contact the quality claim department are going unnoticed. I wrote once before we departed, before the holiday rush, before the out-of-office announcements. I wrote again after arriving at our destination with our dilapidated bag, not to mention our lodging was only a short drive from corporate headquarters. I'm tempted to write again in hopes that my third complaint finally grants me some notice, but alas, nothing yet. Customer concerns that I submitted to Calphalon and Mixbook after submitting my Rossignol request were answered within the week, even less if I really wanted to be picky and check my records. Meanwhile, I'm kicking and screaming over what feels like a waste of money on a ski bag that was barely used but would be awesome if it actually worked well for more than one flight. Sure, this Super Haul made five round trips last winter, all but one leg were with the damaged zipper, but that's nothing compared to the ski bag it was supposed to replace. That Volkl bag left a plastic trail in its wake as we dragged it through airport after airport from December 2005 until March 2010 and it disintegrated bit by bit and we knew that duct tape could no longer fuse it together and still protect our skis. 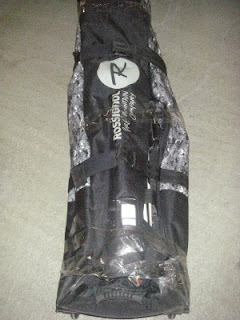 Would I buy a Rossignol gear bag again? I'd like to but after feeling ignored as a customer, I'm not so sure. My Super Haul is either defective or poorly constructed. I'd like to think the former and am hoping that someone at your company can confirm that--and soon.